It has been a few very full days since my last post. I would wear you out (and me too) if I tried to write it all down now. So, I’ll give you little bits each day to catch you up and fill you in on this beautiful part of my journey. Harrah & I met briefly at church one day in 1992. A few weeks later, I met her mom. Turns out, her mom was staying with her, and I noticed her sitting in front of me at church. The only way I can describe her was strikingly beautiful. She must have been in her late eighties, and she was stunning. Wavy white hair, not quite shoulder length, a solid silver necklace set against clear olive skin, bright piercing eyes, elegantly dressed. I said hello and she began talking to me about her pure-bred racing horses. Her voice had that east coast accent, similar to Barbara Walters. I knew instantly she was not from Sonoma County! I also knew she must be Harrah’s mom. She had that striking elegant natural beauty. I got to know Harrah some time later. I had just completed the Breakthrough Training, and was on the volunteer team for the next one. One of my duties was to calligraphy names onto popsicle sticks. This is not as easy as it sounds! I was instructed to give Harrah a call, since she had had this job for the previous training, and could teach me how to do it. So I called and one Saturday afternoon she showed up at my door. We spent the rest of the day painting, writing names, and talking, mostly about men and relationships. I was fascinated by her beauty and her perspective. She’s sixteen years older than I am, with a world of experience far different from my own. I always thought of myself as creative, but Harrah was a true artist. A professional graphic designer, educated and knowledgeable about the world. She was in the throws of a painful divorce. She was dealing with her mom’s dementia. We had both just completed this training and were exploring new perspectives on life and relationships. Over the following months, through mutual friends, our relationship grew slowly. We’re trying to recall when it was really sealed, and neither of us can recall a specific incident that bonded us. All I know is that she became more and more important in my life. It was a season of great transition for both of us. I was beginning to emerge from my very claustrophobic shell. I believe both Harrah and Kim were sent to assist me in that process. Harrah came from an old east coast family with connections to famous industrialists. Her home was filled with interesting beautiful things, each with a story. The color and texture of her life made my controlled little box feel all the more sterile, small, and oppressive. It made me want to rip out the walls and start decorating my life. She would call me to go with her to events I hadn’t heard about or ever considered attending: Glendi, the annual Eastern Orthodox festival with food, music, and participatory dancing from Eastern Europe – put on by our local Eastern Orthodox community. I didn’t even know we had one. Then there was the Sebastopol Celtic Festival, rich in Irish and Scottish music and art, with a healthy sprinkling of the old Sebastopol hippy dippy tie-dye patchouli oil culture. She also invited me to join a Scottish Country Dance class with her, complete with Bagpipes, drum, and fiddle. It was great fun, and the new friends I met there encouraged me to get in touch with my Gilmore Scottish roots. Most of all, Harrah became the wise woman rock I leaned on through probably the darkest time in my life. When I was lost, ashamed, alone, frightened, heartbroken, and disillusioned, Harrah was the friend I clung to. Her wisdom, experience, and compassion helped me step away from my circumstances, see the bigger picture, and find hope that this too shall pass. She was a safe harbor in a terrible storm. She moved to Maine a month before I married Steve, but she flew back to be in my wedding. We spent the third week of our honeymoon at a friend’s guest house on Chebeague Island in Maine. Harrah came out and met us one day, made us a lobster dinner, and brought the cheer and love of home and friendship to this beautiful spot. It’s been almost ten years since I was married and she moved away. We’ve seen each other a few brief times over the past decade, but this visit is all about quality time. I’ll share more about life here in Maine tomorrow. Today, I wanted to catch you up on this most precious friendship. Fawnsie, Harrah was living in Maine in 2005–that was the year Paul & I got married. Wasn’t this photo taken at the Mikayla Drive house? If so, must’ve been Christmas 2000 or 2001…..now I’ll read the rest of the blog. OK, that’s the window at our house and the window ledge we decorated for our annual girls’ Christmas dinner. So, it must be 1998 or 1999. Wow, the years do fly by. Love your writing style-it’s from your heart and what a lovely place that is! Love to you both, dear dear friends. 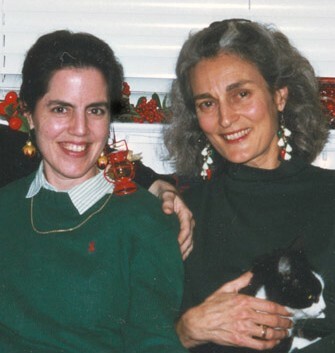 Hey Sandy, nope, it was 1995 because it was before Harrah cut her hair, and I’m wearing the necklace Sam gave me. (I had put 2005 because I keep getting my decades mixed up, so I fixed it. What does that say about turning 50?) Oh I was so very prim. Yes. It was dear Boogie. What a sweet cat. Great story of you two. Thanks for sharing. Harrah had given us all ornaments for Christmas. We decided to wear them for the remainder of the evening. I love your writing Fawn and detailed observances.